Robots might not be out to get us after all - in fact, they're proving pretty handy in helping therapists study people and improve their lives. The Social Robotics lab at Yale University is pioneering robotic therapy in a wide range of fields, including helping kids with autism develop a deeper connection to others. They've found that robots yield a "robust and repeatable" positive response from kids in many difficult situations. Those include teaching nutrition to six-year-olds, as well as English to kids who speak Spanish or Portuguese at home and how to cope with bullying. The lab has also successfully used robots to work with teenagers who have behavioural disorders or anger management troubles. "I'm more interested in people than I am in machines, and the robots we build all serve a purpose," says Brian Scassellati, who runs the lab. "That purpose is to help kids." 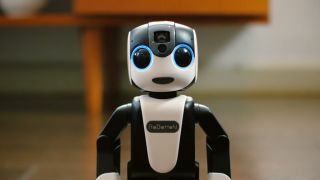 Despite his successes, however, Scassellati doesn't fully understand why kids connect so easily with robots. "Believe me," he says, "we've tried so many different things over the years to figure out how it works."